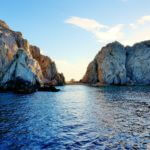 Cabo San Lucas is one of Mexico’s most cherished beach vacation destinations that boasts a number of wonderful attractions on land and on sea. By far the most obvious and celebrated attraction is El Arco or the Land’s End arches that feature on many postcards and the front of guidebooks and leaflets. Lands End is located at the very tip of the Baja California peninsula and signals the place where the Pacific Ocean and the Sea of Cortez meet in spectacular fashion. The rock formation was carved out over the centuries so that today it is a common and beloved feature in Cabo San Lucas, delighting tourists visiting the beach destination year after year. There is a curious story behind how the rock formation got its name in English. The Spanish version is obvious, El Arco, or “the Arch” is self explanatory yet Land’s End is supposed to have emerged because if you took a direct route south, you wouldn’t see any land until you reached the South Pole! Luckily for tourists seeking sunny climes, the South Pole is still a very long way away, and its direct trajectory has little influence over the warm temperatures you can expect in Cabo San Lucas. No one expects you to swim to Lands End, although it is very easy to reach from Cabo San Lucas. Take a water taxi from Cabo San Lucas Marina or hire a private manned yacht or panga (small fishing boat). Once you are there you can decide whether you want to stop off and explore the beaches. Although El Arco seems to rise from the sea, there are actually beaches where you can spend the afternoon or enjoy a swim. From here you can explore Lands End snorkeling or scuba diving or simply play in the water. There are two main beaches for you to experience, Lover’s Beach and Divorce Beach. Lover’s beach is safe for swimming while entering the water on Divorce beach (as its name suggests) should be avoided at your peril. 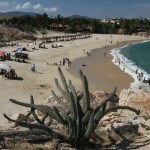 The calm currents and warm water here, and in Cabo San Lucas in general, make snorkeling and diving a pleasure. The sea is full of wonderful examples of marine life, including sea lions and turtles. Being that Land’s End is a breeding ground for pelicans, you may also want to watch out for pelican divers as these amazing birds bomb the water hunting for breakfast. And finally, while you are there, get out the camera and take a photograph or two to share on your social networks like Instagram, Twitter and Facebook. 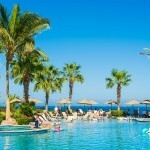 Share the post "Lands End at Cabo San Lucas"